Seamus Conneely has picked up the award for PFA Community Player of the Season for his commitment and effort in organising a variety of community events throughout 2018/19. The Stanley Captain claims the award, which is judged by a panel of representatives from Accrington Stanley Community Trust and the PFA. 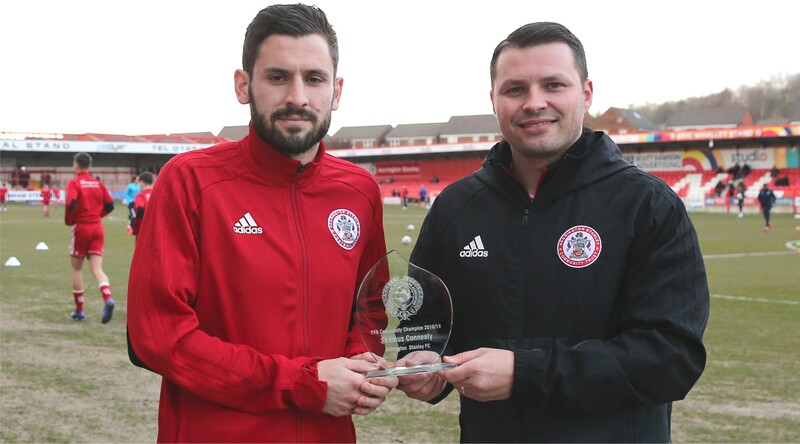 He was presented with the award ahead of the Accrington Stanley fixture with Rochdale in April, by the Community Trust’s CEO, Martin Fearon. Conneely continues to contribute a great deal both on and off the pitch. He is the nominated PFA representative for the Football Club and has visited several schools and community events in Hyndburn and surrounding areas this season. Conneely is an influential member of the first team and helps the Community Trust organise the events and ensure players see the importance in getting out in the community. Photo (www.kipax.com): Seamus Conneely – Captain, Accrington Stanley FC, Martin Fearon – CEO, Accrington Stanley Community Trust. Martin Fearon, CEO of Accrington Stanley Community Trust, said: “Seamus has played a big part in organising player visits for the last three seasons. He is also the Ambassador of our Sports Participation programme and has supported several different projects throughout the season. “His commitment to give back to the local community is fantastic and he is a great role model for the young children of the local area. Seamus continues to go above and beyond the traditional role of a professional footballer and it is fantastic to see the positive effects the player visits are having on the local community”. NEXT Next post: Stanley Kickers kick off soon!